A high number of tender points, which may correlate well with hot spots in thermograms, is an essential criterium for the diagnosis of fibromyalgia. A study in 18 patients diagnosed as fibromyalgia by the criteria of the American College of Rheumatology was made to determine the number of hot spots in these patients. The patient findings were compared with those of a group of healthy subjects and also a group of pain patients which did not meet the diagnostic features for fibromyalgia. Thermograms of the regions typical for the location of tender points were recorded after acclimatization for 15 minutes to a room temperature of 24°C. Hot spots were defined as any small area being at least 0.5 degrees warmer than the surroundings. After thermography the typical sites for tenderness were tested. As expected, the number of tender points differed significantly between fibromyalgic patients and both control groups. Furthermore the number of hot spots was higher in patients with fibromyalgia than in healthy controls. However, there were less hot spots than tender points, and a general coincidence of hot spots with tender points was seldom found. Although the number of hot spots is increased in patients suffering from fibromyalgia, the number of tender points on the patient can not be replaced by recording hot spots in thermograms. There is growing interest in diagnostic criteria for diagnosing fibromyalgia, formerly called fibrositis. In 1990 the American College of Rheumatology (ACR) published a revision of diagnostic criteria, which are mainly based on a high number of tender points tested over 18 defined sites 1). In the late seventies Smythe had already proposed 14 specific areas to prove tenderness in fibromyalgic patients 2). There is some evidence in the literature, that tender points correlate well with hot spots in infrared thermograms. This was shown for patients with epicondylitis 3). A. Fischer was able to prove that hot spots are characterized by a significant lower threshold for pressure pain than the contralateral side of the body without a hot spot 4). This phenomenon was also found in epicondylitis 5) and myofascial pain syndromes 6), but was not seen by Swerdlow and Dieter checking hot spots in other parts of the body7). We therefore investigated the thermograms of patients with clinically proven fibromyalgia to see if they also show a high frequency of hot spots compared to healthy subjects or pain patients, which did not fulfill the criteria for fibromyalgia. Out-door patients were included in the study. After recording the history, the tenderness of typical sites, as defined by Smythe, were checked. The diagnosis of fibromyalgia was made in cases of widespread pain for at least 3 months, sleep disturbances and either slight depressive mood or decreased work ability and a minimum of 8 tender points. Patients, who did not meet these criteria, were diagnosed as localized myofascial pain syndrome. In addition, in 7 healthy female subjects the tenderness of typical sites for fibromyalgia was checked. The investigated sample fell into 3 groups: 1 group suffering from fibromyalgia, 1 group with localized myofascial pain syndrome and one of healthy controls. 1 to 3 days after the first clinical investigation, a series of thermograms was performed on all participants of the study, at a room temperature of 24 degrees and acclimatization for 15 minutes without clothes. Images were taken from the neck (both lateral views), from the chest (front view), from the shoul-der-girdle (back view) , both elbows and forearms (lateral view) , from the lumbar spine and the buttocks (back view), thighs and knees with one foot in front of the other (lateral view). Either an Agema 870 or an NEC San-ei Thermo tracer, both electronically cooled Infrared-Scanners, were used for imaging. After thermography, the tenderness of typical sites was checked and recorded again by either a physiotherapist or a research nurse. Thermal images were modified by a low pass filter and then checked for hot spots. A hot spot was defined as a small region at least 0,5 degrees warmer than the surroundings. Only hot spots located nearby the sites checked for tenderness were accepted. Hot spots originating from varicose veins were not included in the findings. The number and location of tender points and hot spots were compared statistically within and between all groups of investigated subjects. The fibromyalgic patients were significantly older (Kruskal-Wallis 1 way Anova: p=0,0002), showed a higher number of tender points (Kruskal-Wallis 1 way Anova: p<O,0001) and more hot spots (Kruskal-Wallis 1 way Anova: p<0,0001) than the other both groups. After computing positive hot and tender points together into one data file of all investigated sites, the number of tender points and hot spots differed significantly (McNemar Test p= 0.037). This was caused by the fact that over 74 points, a hot spot was seen over a non tender site, and at 98 sites a hot spot was missed over tenderness. On the remaining 308 sites, 132 hot spots were localized over tenderness and on 176 sites neither pain on pressure nor hot spots were detected. Diagnostic accuracy (defined by the percentage of true positive and true negative cases) ranged between 83,8 ‘% (Left trapezius) and 54,8 % (low cervical sites, left knee) for the total sample. The findings of the study showed clearly, that fibromyalgic patients present a significantly higher number of hot spots over specific sites than either patients with localized pain syndromes or healthy controls. Although both control groups differed in the number of tender points, these sub-samples could not be distinguished by the number of hot spots. Two established sites for checking muscle tenderness, are extremely difficult 10 assess by thermography. Because varicose veins can very often be found on the medial knee site, i1 is almost impossible, in this region, to correlate muscle tenderness with hot spots. On the lateral view of the low cervical spine, the heat from the upper thoracic wall causes similar difficulties for interpretation. As far as one can conclude from the small number of cases in this study, there might be an overlap in number of hot spots between fibromyalgic patients and even healthy controls. For example, one young women without any tender points presented as many as 7 hot spots over specific sites. Taking in account the clinical experience that fibromyalgia appears together with specific personal traits, one is tempted to speculate, whether hot spots might precede the disease before it is fully developed. Following this idea, the high number of hot spots in some subjects of the control groups, was not unexpected. Nevertheless, patients with whole body “speckled” thermograms, meaning a high number of hot spots, should be suspected of suffering from fibromyalgia. In those patients, a typical history and the count of tender points will finally confirm this diagnosis in most cases. Since BC 400 when Hippocrates used temperature in a diagnosis by applying mud to a patient’s body and speculating that dry areas had disease, temperature has been an important area of interest in medicine. The skin is a very important organ in temperature regulation, and body temperature is controlled by the combined control of the central and autonomic nerve system. Infrared thermography (IRT) detects infrared light emitted by the body to visualize changes in body heat due to abnormalities in the surface blood flow of diseased areas. IRT is not a tool that shows anatomical abnormalities, but is a method that shows physiological changes. It objectively visualizes subjective symptoms, therefore, it is useful in making diagnoses and doing evaluations in the field of pain medicine where a diagnosis is based on subjective complaints of symptoms. The advantages of IRT is that it is non-invasive and painless, it is not harmful to the patient, it is possible to conduct tests in a physiologically natural state, and its testing time is short. The aim of this paper is to introduce the basic mechanism of IRT, significance in interpretation, and clinical utilization. The most important theoretical background of IRT is that the distribution of body heat in a normal body is symmetrical. Therefore, the symmetry of body heat is considered to be the most important element when interpreting IRT images. An infrared camera is used to measure infrared light emitted from the body and displays this on the screen, and pseudocolor mapping is done on the obtained infrared image to facilitate visual interpretation. Therefore, when comparing the distribution of body heat on both sides of the body, the region of interest (ROI) is set to an equal size on each side of the obtained pseudocolor image, and the mean temperature within each ROI is calculated to compare the difference. There are two methods to compare the temperature difference within an ROI of the affected and unaffected sides. The first method is to define a significant difference such as when the asymmetry of temperature deviates from 1-standard deviation of the unaffected side ROI, and second is to define the significance such as when the difference in mean temperature of both ROIs is more than the ‘reference temperature difference’. The latter method is mainly used in the clinical field. After Galileo designed the first thermometer in 1592, infrared light was discovered by William Herschel in 1800, and the first diagnostic IRT was used in diagnosis of breast cancer by Lawson in 1956. Then, in 1982, the US Food and Drug Administration approved IRT as an adjunctive screening tool of breast cancer, and up to now, there have been many studies regarding the usefulness of IRT in various areas such as complex regional pain syndrome (CRPS), postherpetic neuralgia, whiplash injury, inflammatory arthritis, temporo-mandibular joint disorder, headache, and myofascial pain syndrome. The diseases where IRT can be used are presented in. Considering that IRT visualizes physiological and functional abnormalities rather than anatomical abnormalities, there is no doubt that compared to other imaging diagnostic methods, IRT is an effective diagnostic method for diseases difficult to diagnose with CT or MRI, such as CRPS, neuropathic pain, headache, and myofascial pain. In fact, for CRPS, it is known to have higher sensitivity compared to MRI or three phase bone scan, and it is reported that thermography has higher sensitivity in diagnosis of neuropathic pain compared to the sympathetic skin response test. When deciding an abnormality in specific diseases, there are different views on what the ‘reference temperature difference’ should be according to researcher, and for CRPS, standards such as 0.6℃ and 1.0℃ are used. Meanwhile, regarding the reliability of IRT, research has been conducted for CRPS and myofascial pain syndrome, and it was reported that there is high reliability for these diseases. In terms of correlation between pain and temperature difference measured with IRT, it was reported that there was a significant correlation between the severity of pain caused by lumbar disc herniation with the difference in skin temperature. It was also reported that there was a significant correlation between the pressure pain threshold and the temperature difference in myofascial pain syndrome. Recently, the technique, which obtains a dynamic image using a stress loading test as well as static IRT, is widely used. The theoretical basis for this is that normally the temperature change on both sides of the body after stress loading is symmetrical, and the degree of temperature restoration after removing the stress is symmetrical on both sides. Therefore, when restoration of temperature is asymmetrical after removal of stress, it is considered that physiological abnormalities exist. For the stress loading test, cold/warm stress, exercise, pharmacological stress, vibration, and visual stimulation are used as stress, and from these, the cold stress test is used the most. When using cold stress thermography, it is known that sensitivity and specificity is enhanced for diagnosis of CRPS, but it causes pain for the patient during the cold stress thermography, and a standardized guideline for the stress loading test has not been established. Currently there are no established standards for setting an appropriate ROI. The ROI is set as symmetrical on the pseudocolor image based on the discretion of the examiner taking into consideration the medical history and symptom area of the patient. Therefore, according to the size and shape of the ROI, the temperature difference on both sides can be calculated differently. In addition, the IRT equipment currently used only shows the mean temperature and standard deviation within the fixed ROI, and the actual interpretation of the IRT image only compares the mean temperature of the ROI without considering the size of the ROI. In principle, when comparing two means, statistical difference is determined by considering the mean, standard deviation, and sample size. Thus, when only the mean values are simply compared without considering all these items, there is the possibility of error based on statistical interpretation. Therefore, considering the number of pixels in the fixed ROI (reflecting sample size), and the mean and standard deviation of the temperature in interpreting results can reduce false positives and false negatives, and enable objective interpretation of the results. For this, an ROI of equal size symmetrical for both sides of the body is set, and the t-test can be used taking into consideration the mean temperature, standard deviation, and number of pixels in the ROI, or the pixels on each side can be matched 1:1 to conduct a paired t-test for the temperature difference in each matched pixel. Based on personal opinion, it is difficult to satisfy the assumption that the left and right side of the body are independent; thus, using the paired t-test with matched pixels is thought to be a more valid method statistically. However, there is no testing equipment which provides this kind of function presently. Hence, it is anticipated that an IRT system will be developed to enable such statistical analysis in the future. Recently, there has been much effort to improve the hardware and software of medical IRT. Developments have been achieved such as enhanced performance of the infrared sensor, improved image quality, real-time image processing, and a multi-channel system. As a result, it is possible to obtain precise images with a thermal resolution of 0.08℃ or lower and a special resolution of 1×1 mm or lower. A 3-dimensional image technique was also developed to show the body heat in a more detailed image compared to the existing 2-dimensional image. In addition, recently a remote diagnosis system was established to decipher images from a long distance away. IRT is a non-invasive and safe diagnostic method which visualizes functional abnormalities and is used effectively in the diagnosis of numerous diseases and in the evaluation of treatment effect. Compared to other imaging diagnostic methods, it shows high diagnostic performance in pain diseases, and even higher sensitivity and specificity is obtained when using the stress loading test. Together with the development in medical technology, it is anticipated that the use of IRT will gradually increase in the field of pain medicine. Parameters of thick and thin nerve-fiber functions as predictors of pain in carpal tunnel syndrome. Pain intensity in carpal tunnel syndrome (CTS) was correlated with neuro and psychophysiological parameters related to the function of different nerve fiber classes within the median nerve in 23 patients. Control data were obtained from 16 normal subjects. Mean intensity of all pain attacks which occurred 14 days before surgical treatment was assessed on visual analogue scales (average CTS pain). Functions of thick myelinated nerve fibers were determined by motor and sensory nerve conduction studies. Functions of thin myelinated and unmyelinated nerve fibers were evaluated by measuring thresholds of warmth, cold and heat pain on the index and little finger. Pain intensity and neurogenic vasodilatation following noxious mechano-stimulation on the interdigital web between index and middle finger provided additional information on the functioning of nociceptive nerve fibers. Sympathetic reflexes induced by these painful stimuli were assessed by means of infrared thermography and photoplethysmography. Mean intensity of pain attacks (40 +/- 19% VAS) correlated significantly with latency (r = 0.58, P < 0.01) and amplitude (r = -0.50, P < 0.01) of the compound action potential from abductor pollicis brevis muscle following distal median nerve stimulation. Thresholds of warmth, cold and heat pain on index finger were significantly increased during CTS when compared to the control subjects. The magnitude of neurogenic vasodilatation and sympathetic vasoconstrictor reflexes were not significantly different. Average CTS pain correlated inversely to the threshold of heat pain on index (r = -0.46, P < 0.05), but also on the little finger (r = -0.41, P < 0.05), which is not innervated by the median nerve. Temperature difference in the skin surface reflects the abnormality present in the human body. Considering the phenomenon, detection and forecasting the change of temperature is the principal objective of using Medical Infrared Thermography (MIT) as a diagnostic tool for inflammatory pain diseases. Medical Infrared Thermography (MIT) is a noninvasive, non-contact and fast imaging technique that record and monitor the flow of body temperature by receiving the infrared emitted from the skin surface. Based on the standardization of thermogram acquisition and processing techniques and by the adoption of advanced infrared cameras, presently it is feasible to detect the minor temperature difference of the skin surface in the high-resolution infrared images. Recently, the research on inflammatory pain detection using medical infrared thermography concentrated on the area of temperature and statistical analysis based automated detection of abnormality from the thermograms. The paper introduces a significant review focusing on the area of different inflammatory pain detection using infrared thermography along with the environmental condition, protocol selection, and acquisition system specification in summarized tabular format. Based on the rigorous study of the publications in the area of inflammatory pain thermography, the paper also explores the area of thermogram processing and analysis of pain in a review work format. Human body distribution of temperature is widely affected by pathological abnormalities. Hence the recording of inflammation of the skin surface related with the core temperature distribution can provide essential information regarding the underlying physiological activities. The dissipation of inflammation from the skin surface is radiating in nature and lies in the infrared spectrum of light . The spectrum range of inflammation makes the infrared detector suitable for recording and analysis of the thermoregulatory distribution of the skin. Medical Infrared Thermography is a non-invasive imaging technique that can detect abnormality by allocating and quantifying the inflammatory changes in the skin surface related to the temperature distribution. 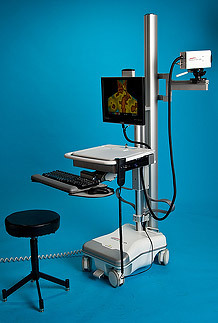 Since 1987, it has been accepted as a diagnostic imaging technique by the American Medical Association Council and also recently approved by American Academy of Medical Infrared Imaging for medical imaging . The detection method of the Medical Infrared Thermography is primarily based on the evaluation of temperature distribution among contralateral parts of the body. In case of healthy subjects the difference in temperature distribution is not higher than 0.5-degree Celsius . Starting from the last eighties, detection of pain using thermal imaging was examined in many past investigations. Most of the investigations provide statistical quantification techniques for the abnormality analysis. Based on the study of the most relevant works published in the past, the paper represents a review work on pain detection using Medical Infrared Thermography along with the survey of acquisition conditions. In the rest of the paper, the section II describes some inflammatory pains that can be detected using Medical Infrared thermography. Section III contains the methodological review work related to the pain thermography. The section IV and V represent the review work related to protocol selection for thermogram acquisition, thermal camera specification and disease related thermogram description in descriptive and tabular format. Finally the conclusion along with future work is made in section VI followed by the acknowledgement and the reference part. Temperature distribution analysis and early detection of abnormality due to inflammatory pain are recognizable by Medical Infrared Thermography. Thermographic detections are compared with the clinical observations and tests for possible confirmations. Although the technique heavily depends on the surrounding and background environment, there are a number of reasons for accepting the technique for diagnosis of inflammatory pain. In general, inflammation is related to pain diseases like arthritis, frozen shoulder, Prolapse Intervertebral Disc (PIVD), spondylosis, etc. which are not defense system begins attacking the healthy tissues instead of detected by clinical observations. In case of arthritis, the immune system of the body become affected and the body foreign substances, and it causes inflammation, pain and joint damage. The presence of additional inflammation due to arthritis can be detected using medical infrared thermography. In frozen shoulder also, pain and restriction of movement arises due to inflammation. The capsule in the shoulder area has ligament and holds the bones of the shoulder with each other. The inflammation in capsule area restricts the movement of joints and generates pain that can be early detected by the thermal imaging. The inflammation due to Prolapse Inter Vertebral Disc (PIVD) pain can generate neuronal activity along with swelling in compression of a nerve in the intervertebral region. Detection and treatment of inflammation using thermography in the initial stage can avoid the nerve compression stage in the human body. The skin of the human body contributes an important part in thermoregulation by preserving or dissipating heat. The infrared thermal imaging or the clinical thermography reports the distribution of temperature in human skin by receiving infrared radiation from the surface of the human body , . In the past years, authors had detected the abnormality in a human body based on the analysis of temperature distribution and correlated intensity distribution of thermograms. In 1995, Kim et al. analyzed the thermal difference to detect the lumbar disc herniation. For this purpose, the severity of pain was measured by Visual Analog Scale (VAS) and Graphic Rating Scale (GRS) and compared with the thermal difference to differentiate and detect acute and chronic disc herniation and its level. The thermal difference that they measured for acute and chronic disc herniation was based on the degree of pain, duration of clinical symptom, comparison with clinical signs, types of herniation according to radiological study and based on level of herniation like mild, moderate and severity of pain and compare with the radiological studies like CT Scan, MRI etc. In the year 1997, Hooshmand, H  also detected abnormality in the whole body related to pain using the temperature analysis method. The analysis had been performed on the control volunteers group and neuropathic pain patients. The method was based on the concept that unmyelinated perivascular sympathetic small c-fibers are the origin of neuropathic pain. As because the c-fibers are too small so that they are best evaluated with infrared thermal imaging compared with EMG/NCV or MRI or CT. After analysis, the rate of true positive was 78% and false positive detected 14%. To analyze pain in the human body using thermal images, Herry et al. suggested a computer aided decision support technique and summarized the result of the analysis in the year 2002. This technique was the combination of image processing and temperature analysis method. In this technique, in the first step, to remove noise from thermal images , they had followed Poisson distribution and removed noise using Wavelet-based removal technique proposed by Nowak and Baraniuk. Then edge detection and morphological operations were adopted for classification of a body part from the image. In the next step, analysis of abnormal high or low temperature areas was performed by statistical analysis and comparison of intensity distributions of symmetrical or comparable regions of interest and the result is summarized in a computer aided decision support scheme. Again in the year 2003, Frize et al. reported a technique based on thermal pattern analysis to detect physiological disorder caused by pain in the human body. The technique was focused on the thermal pattern analysis of normal subjects and abnormal subjects related to pain. For denoising, the thermal images they again followed wavelet-based noise removal technique. To improve the efficiency of images,they removed the undesirable portion of the image. Then to detect the region of interest, classical grid of polygon and isothermal representation of images were used. In the output of image rocessing steps, the statistical analysis was performed to detect an abnormality. Subsequently to detect Rheumatoid Arthritis (RA) Frize et al. proposed a temperature measurement based statistical analysis method in the year 2011. This analysis was performed on a normal group of persons with no rheumatoid arthritis and a group of patients suffering from rheumatoid arthritis. In the first step of the analysis, the difference between the average temperature of joints in the control group and the patient group was determined. In the next step, the identification of joints was performed which gives the best confirmation of the presence of Rheumatoid Arthritis based on the temperature difference. In the last step, statistical analysis was performed to find out the significant statistical difference of temperature of joints in the control group and the patient group. The statistical features used for the analysis was skewness, kurtosis, variance, mode/max, median/max, min/max, maxmin, (mode-mean)2,mode/min, median/min and mean/min. For shoulder impingement analysis, Park et al. also used statistical analysis method to analyze the temperature distribution of related thermograms. The thermography screening was applied to the region of interest of both the control group and patient group. The statistical analysis of thermogram was performed by SPSS 13.0 using the independent t-test for comparison of each Region Of Interest of patient group and control group. The clinical symptoms, physical examination findings and the thermographic findings are compared by 1- way analysis of variance with a Bonferroni post hoc test on numeric data and Pearson x2 analysis for the binomial data. Pearson linear correlation was performed to find the correlation between the clinical and thermographic data. Clinical abnormality was determined based on the finding of asymmetrical distribution of temperature in between the contralateral body parts. In 2008, Lee, Junghoon, et al. proposed a technique for automatic detection of suspicious pain regions on digital infrared thermal images based on SOFES (Survival of the Fitness kind of the Evolution Strategy) algorithm. The suspicious pain region can be detected by using multimodal function optimization algorithm, such as SOFES algorithm  based on the concept that the painful region represents a low temperature or high temperature compared with its neighbor regions on one’s skin in thermography. The preprocessing steps that were required before applying SOFES algorithm are Region of Interest (ROI) detection, FPA sensor’s output signal extraction and applying Gaussian to blur the image. In 2010,Tkacova, M., et al. performed infrared thermography analysis in a group of patients suffering from carpal tunnel syndrome. The analysis was based on the asymmetry factor calculation using the histogram of the temperature distribution of contralateral hand parts. To determine the asymmetry factor, the authors used the method explained by Huygen et al. in the year 1998. The authors Zivcak, J., et al [15. ]extended their work in the year 2011 by applying statistical features in the large no. of thermogram to calculate the asymmetry of temperature distribution. The temperature analysis was performed in 5 points of the dorsal side of the hand. The analysis indicates that the temperature distribution of the median nerve in the dorsal hand side was significantly different between the control group and carpal tunnel syndrome group. The analysis shows 0,714 sensitivity with 0,714±0, 1207 confidence interval and 0,852 specificity with 0,852±0,095 of confidence interval. In 2011, Borojevic, N., et al. [16.] also analyzed the thermogram of rheumatoid arthritis and osteoarthritis in human hand. The basic statistical analysis of temperature was performed. The asymmetry of temperature distribution was measured using 4 ways ANOVA test in between the ventral and dorsal side of hand of healthy and arthritis subjects. The mean value showed the best significant difference between the two subjects (healthy and arthritis subjects). The heat distribution related to rheumatoid arthritis was again evaluated by Snekhalatha, U., et al. in 2012 depending on the heat distribution index. The authors also segment the region of interest using fuzzy c means and Expectation Maximization algorithm. From the analysis, they predicted an abrupt temperature variation in the affected due to rheumatoid arthritis. For thermal imaging related to pain, there is no protocol that is universally accepted as acquisition standard at present. For this reason, each clinic or university or research group follows their own protocol as per their needs. But there is a similarity found in the acquisition condition of patients, room temperature, and other different factors. Frize et al. recommended the thermography at 20°C room temperature. They instructed their patients, not to apply talcum powder, lotion or deodorant on skin on the day of examination. Some controllable factors such as hot drinks, alcohol, physical exercise, etc. could potentially produce effect on the skin. For this purpose, they recommended not to take hot drinks one hour prior to the imaging, not to smoke two hours prior to the examination and to avoid prolonged sun exposure for a week before imaging. Also they suggested avoidance of alcohol twelve hours prior to the imaging and also avoidance of acupuncture, hot or cold presses, physiotherapy, TENS (Transcutaneous Electrical Nerve Stimulation) and physical exercise twenty-four hours prior of the session. According to Park et al. room temperature needs to be set on 19 to 20°C and patients need to be in upper body disrobed condition 15 minutes before the screening to get a stabilized condition. Lee, Junghoon, et al. recommended their patients not to apply any lotion or ointments and also to put off rings, necklaces, and watches. They also recommended that patients should quit physical therapies. According to their preparation for thermography, in order to be stabilized, patients should keep themselves undressed for more than 20 minutes before imaging. Tkacova, M., et al and Zivcak, J., et al  also suggested to keep the region of interest for thermography in undressed condition for 20 minutes before capturing of thermogram at 20°C . The room for thermography was retracted blind from solar radiation. Borojevic, N., et al. performed their acquisition in a stable condition of temperature and humidity. Snekhalatha, U., et al also recommended to perform the capturing in a stable temperature of 20°C with 20 minutes stabilization of patients in disrobed condition at the area of imaging. spectral range of the camera was 8 to14 μm. The dorsal view of the hand was taken parallel at the distance of 0.55 meter and in extended analysis, Zivcak, J., et al  had taken total 268 thermograms of dorsal hand side of both the healthy patients and pathological hands containing Carpal Tunnel Syndrome with 0.98 thermal camera emissivity. Borojevic, N., et al  captured ventral and dorsal side of hand using Thermo Tracer TH7102WL system. Their analysis was performed on the thermograms of 6 healthy volunteers, 8 patients containing rheumatoid arthritis and 7 patients of osteoarthritis. Snekhalatha, U., et al. also captured thermogram of anterior and posterior view of hand for rheumatoid arthritis using ThermaCAMT400 camera from 1-meter distance of the region of interest. The thermograms was taken from 10 patients with rheumatoid arthritis and for analysis thermogram of 10 normal persons are also taken and analyzed. The Table III represents summary of camera specification and details of thermogram and disease in tabular form. With the advent of high sensitivity infrared cameras, Medical Infrared Thermography is becoming an alternative diagnostic tool for inflammatory pain detection. In addition to high sensitivity, thermogram resolution and accuracy, infrared thermography is a non-invasive methodology with harmless imaging technology. The thermograms are stored digitally for further analysis using various software packages and image processing based analysis to obtain the pattern of temperature distribution. In this paper, the methodological review briefly describes the analytical methods of pain thermograms. Studies so far indicate that, the statistical analysis of temperature distribution of thermogram is common and widely accepted method for abnormality analysis related to inflammatory pain. The review based study also shows that, the control environmental condition and proper protocol selection for minimum interference are effective parts of the accurate thermogram acquisition. But there is no protocol that is universally accepted for inflammatory pain analysis a present. In the future phase, the work will be extended by creation and analysis of database related to inflammatory pain in the human body by following required standardized protocols of thermogram acquisition.